One of the scariest things that you can experience as a driver is the loss of control over your vehicle. Hydroplaning occurs when your vehicle’s tires begin to skim along a layer of water on the surface of the road instead of connecting to the road itself. You don’t necessarily have to be caught in a downpour for this to happen. All it takes is a bit of moisture or grease on the road. 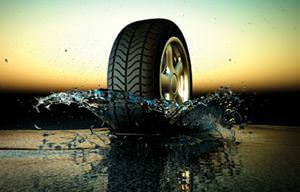 If you keep an eye on your tire tread and perform regular rotations, your chances of hydroplaning will be much less. The more tread you have on your tires, the more easily they will stick to the road. If you live in an area where it rains often, you may also want to consider buying tires that are specifically designed to be resistant to hydroplaning. They may be a bit more expensive, but they could actually save you money if they help you avoid an accident. Cruise control is an awesome thing under normal circumstances, but you should always disable it during bad weather. If you began to hydroplane while driving with cruise control on, you would need to turn it off before regaining complete control over your car. In the right situation, these few seconds could potentially mean your life. Your greatest chances of hydroplaning will occur when you drive across puddles of standing water. The deeper the puddle, the more dangerous it is to cross it. Whenever possible, steer around large puddles. If you’re driving on the freeway during heavy rain, try to drive in the left lane as puddles tend to accumulate on the right side of the road. Watching your speed is the number one way to avoid an accident, and its importance is much greater during rainy weather. Your car is most likely to hydroplane while traveling faster than 35 miles per hour, so whenever you can, avoid the freeway and take smaller roads to get to your destination. Also, avoid suddenly increasing your speed. If you need to drive faster, make the transition slowly instead of flooring the gas pedal. Even if you make your very best effort to stay safe, there is still a chance that you could lose control and begin to hydroplane on the road. If this happens, take your foot off the gas pedal and gently steer your car in the direction that it’s moving. Your instinct will probably be to turn the wheel the other way, but this could cause your car to veer sideways and completely lose control. Whatever you do, don’t slam on the brakes as this could make the situation worse. If you do experience a moment of hydroplaning, it’s a good idea to pull over on the side of the road as soon as you can. Even while traveling at low speeds, hydroplaning can be a very scary and unsettling experience and driving while upset is never a good thing. Hydroplaning can happen to anyone, but it likely won’t happen to you again for some time, so take a few minutes to calm yourself down before carrying on.